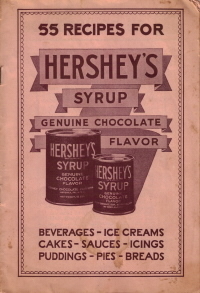 Here's an old recipe booklet from Hershey's Chocolate Syrup, there's no date anywhere but I would guess this is from the 1930s, maybe earlier. The book is a bit stained in some spots but in otherwise great condition, all the recipes are clear and easy to read. Each of the recipes are available below, just click one of the page titles to review the recipes in each category. There are 55 recipes for Beverages, Ice Creams, Cakes, Sauces, Icings, Puddings, Pies and Breads. I've also scanned pictures of each page, just click the small version on the recipe page to view a large copy.